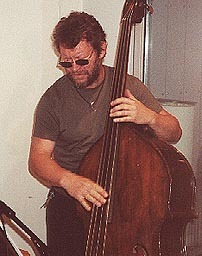 Double-bass player Palle Danielsson was born in 1946 and grew up in Stockholm. In a 1951 jazz magazine you could read: "The name of the youngest dance musician in Sweden is Paul Danielsson, five years old, who plays the mouth-organ and the swanee whistle. He knows 'Mocking Bird Hill' almost by heart". - Palle had performed together with his eleven-year-old sister Monica who had in turn played a boogie-woogie tune. Today Monica (Dominique) is a well-established pianist and composer. At this early stage in his life he had no idea that he would become a musician. It wasn't until a few years later when there was a selection for admission to what was the first music school in Stockholm. His sister who studied there seemed to enjoy it very much when she sang together with her schoolmates and he thought that he would like to do the same. Palle started playing the violin but changed to the double-bass. When graduating from the school he became a student at the Royal College of Music in Stockholm in 1962 and at around the same time he started playing as a professional. He almost immediately was ranked among the very best Swedish jazz musicians and started touring with different groups. In the autumn of 1965 when he was only 19 years old, he got a job with Bill Evans at the jazz club "The Golden Circle" in Stockholm. Before the gig he had a brief meeting with Bill Evans, they played a couple of tunes and Palle was accepted. A reviewer wrote: "Danielsson is either too naive or too talented not to get automatically frightened to death". But Palle didn't think that way. Says Palle: "If you know how to ride a bike, well, then you know!" So Palle discovered his musical identity very early. He liked some of the music that he listened to at The Golden Circle, for example Jim Hall and Art Farmer with Steve Swallow and Pete LaRoca. They played music on a very high level, at quite a low volume but containing an enormous energy. He had heard Bill Evans before the opportunity came to play with him and he preferred Evans' way of playing to bebop jazz, which he considered somewhat vulgar at times with a little too many "licks" and quotations. But actually he didn't dislike any particular style. In the 60's Palle toured Europe together with trombonist Eje Thelin, drummer Billy Brooks and saxophone player Barney Wilen. Touring foreign countries gave him a particular perspective on Sweden and how it was to be a jazz musician there. So once, after having returned to Sweden, he decided not to allow anyone to oppress him. Usually he survived for a while on the inspiration of what he had experienced but then the treadmill began to wear him down again. It was Eje Thelin who taught him to stand up for what he was doing on stage and who also encouraged him to take responsibility, to express himself clearly and honestly. Eje also gave everyone in his group complete freedom, but at the same time responsibility to take care of his own role in the music. Palle has broad musical references and gets very moved by beautiful harmonies and he can gets gooseflesh listening to, for example, Bach, Bartòk and Alban Berg. He is also a player with an exceptional technique, combined with an uncanny ability to 'localize' the natural spaces in music and fill them with lightning reflexes. For all this, he is essentially a group player, uninterested in being the star of the show. Palle Danielsson is undoubtedly the internationally best-known bassist from Sweden. As a member of Keith Jarrett's "European quartet" he laid the foundation for a worldwide reputation as a tasteful player with rock-steady time, a reputation he has built upon and refined with equal parts calmness, good judgement and talent. Parallel with his stint with Keith Jarrett's group, Palle was a member of the renewed Swedish-Norwegian group with Jan Garbarek and Bobo Stenson for a couple of epoch-making years during the 70's. He was also the obvious choice when saxophone legend Charles Lloyd - after a 12-year silence - made his comeback in the beginning of the 80's and for several years Palle was the anchor for the French wizard Michel Petrucciani. During the 90's Palle has recorded and toured regularly with the English pianist John Taylor, and ex-Weather Report drummer Peter Erskine's trio. Currently he is also a member of Nordan, the constellation that has spread Swedish folk music far beyond Scandinavia's borders and for the past few years he has led his own quartet, Contra Post. Together with three of his favourite musicians - drummer Anders Kjellberg, pianist Rita Marcotulli and saxophonist Joakim Milder - he makes his timeless journey in a contemporary jazz circle with the freshness of unbroken ground.